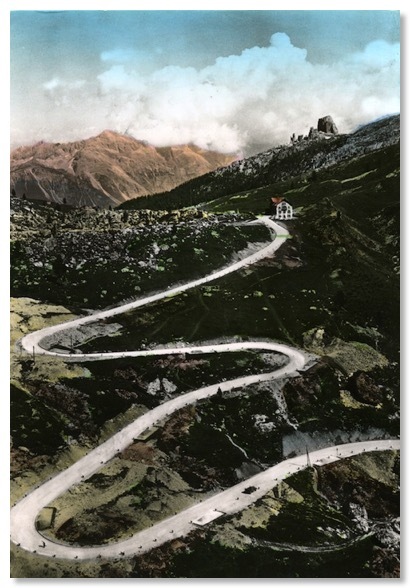 Our journey along The Road has now reached the section I probably know best of all, and about which I have been collecting postcard views for the last 20 years or more. Without any false sentiment, it is an area seldom far from my thoughts. 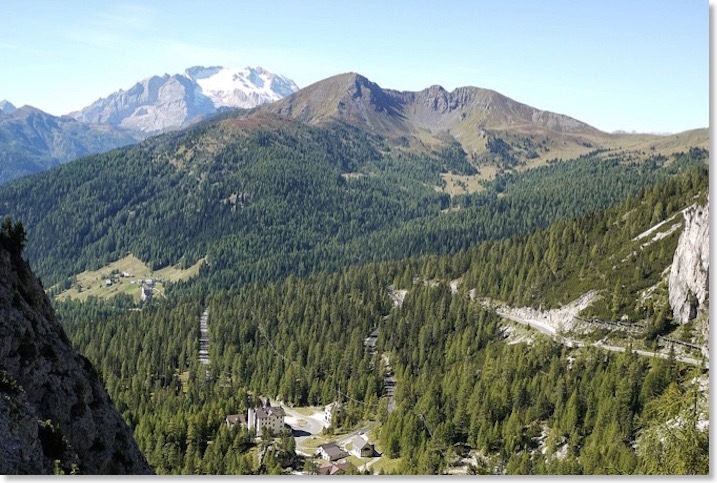 That said, however, in 2011 I had failed to find Zardini’s viewpoint for this photograph! On a revisit in 2013, what looked to be a simple walk through trees, for another attempt to find it, turned into an hour spent fighting my way through mature forest and scrub, but I came away with a close match, reproduced above. 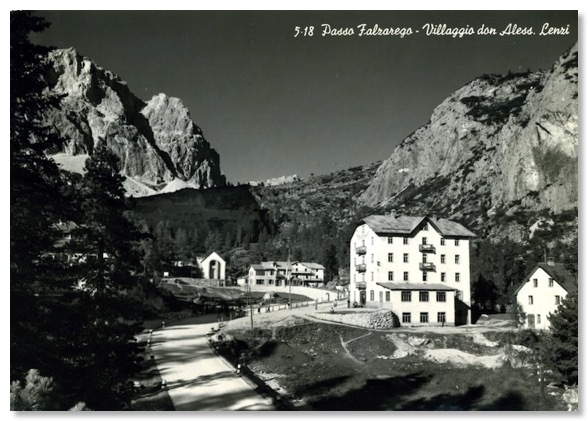 The postcard below, found while browsing another Italian flea-market, is not post-marked or dated, but looks quite early. 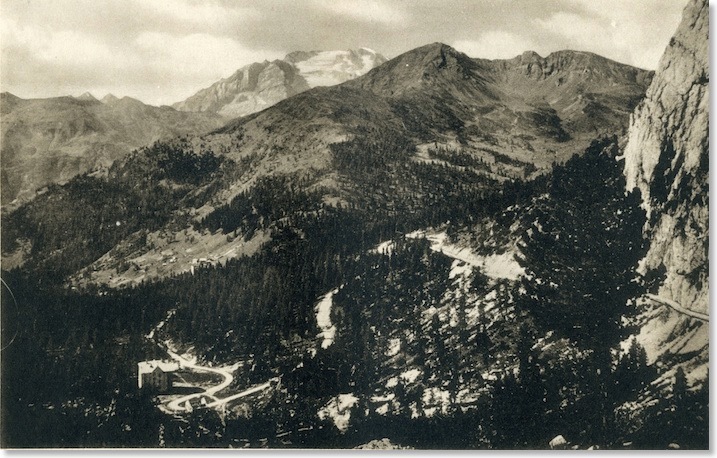 At a guess, it shows this area in the 1920s. 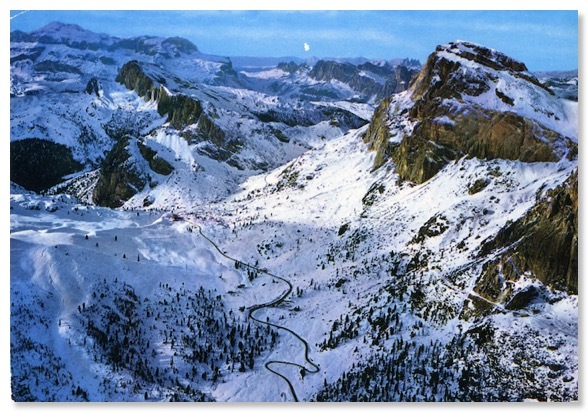 The view is south eastwards, across the summit of the Falzarego Pass, with the Cinque Torri (right) and the peak of the Sorapis in the background. 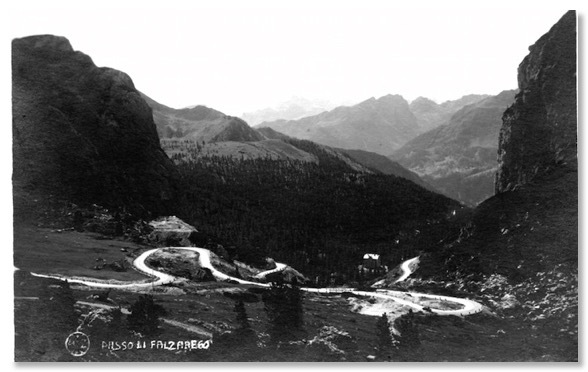 The winding stretch of The Road shown runs from the tunnel covered under Photo 24 up to and over the top of the Falzarego Pass itself. 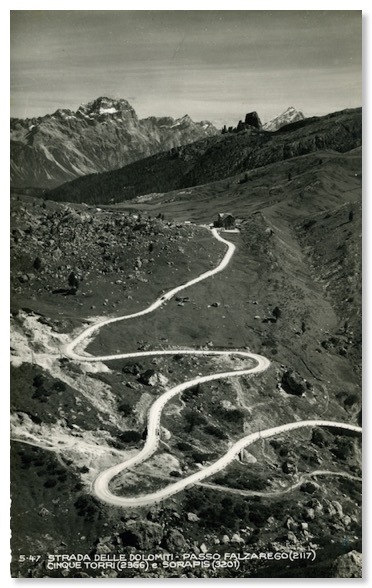 The road is still white, suggesting it’s still gravel - as it was until the early 1960s, I believe. 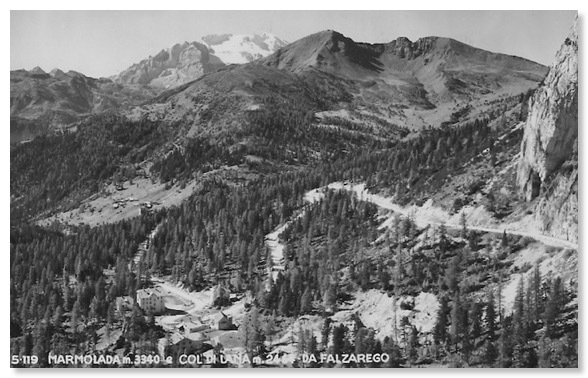 My copy of the black and white card is postmarked 1965, indicative of the lifespan these pictures had in their day, because, although it looks older, and I was tempted also to regard the hand-coloured card as the earlier one, I then noticed that the black and white shot shows no trace at all of the Valparola Pass road (seen coming in from the left of the shot, opposite the pass-top building in the other picture). 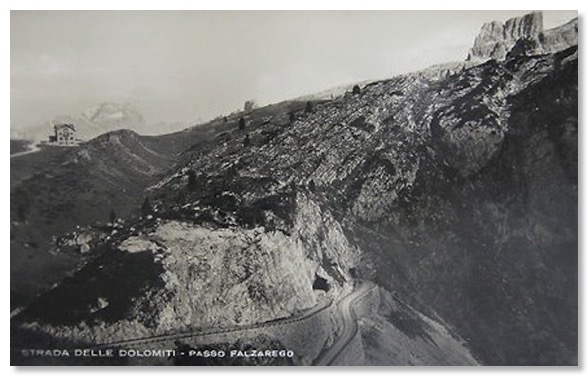 I do not think this is simply due to the angle of view; the road in the coloured version is wider, and has been straightened out in some places. 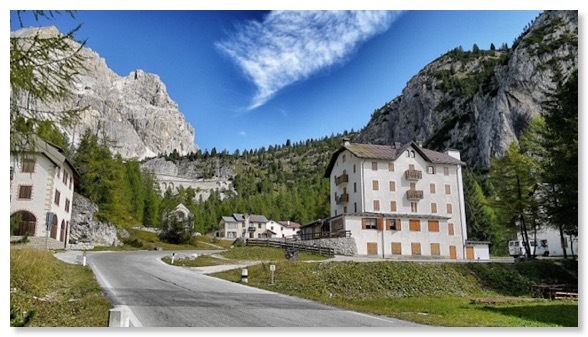 The Valparola Pass road runs from a major WW1 fortification (nowadays an interesting museum and visitor centre). 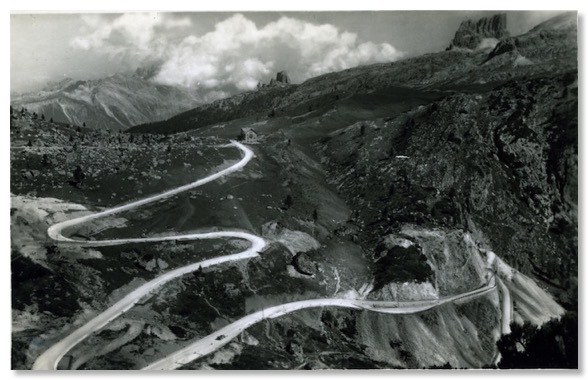 However, to date, I have not been able to discover when that section of road was created. 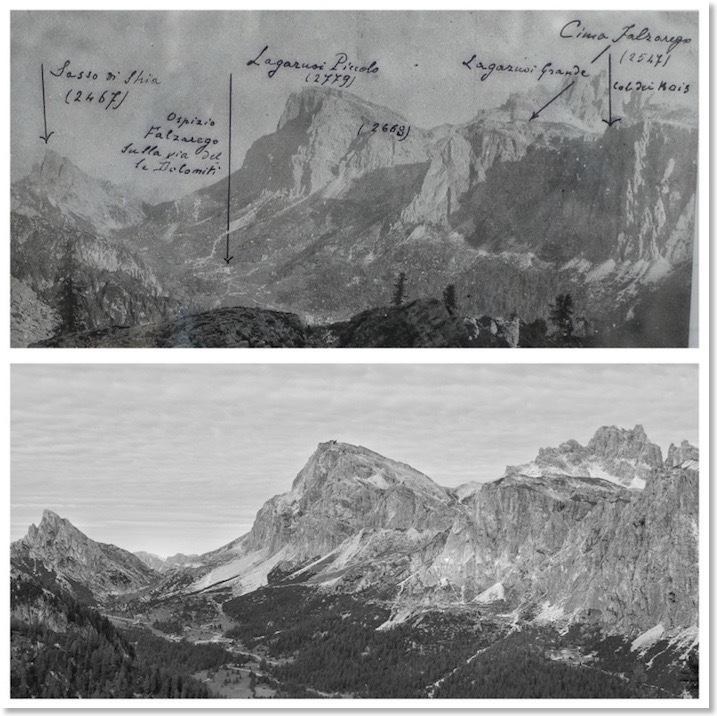 Comparing these two photos, you will see that the summit of the Piccolo Laguzuoi, in the centre, is somewhat differently shaped in the more recent view. 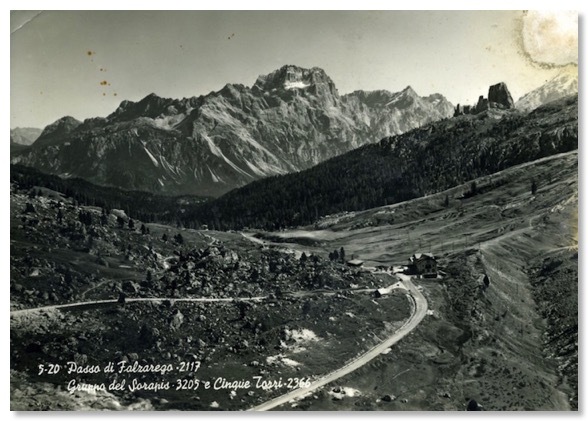 This is because much of it’s left hand side (as viewed from this point) was blown away in the WW1 fighting, by explosions in mines dug by Italian troops beneath the Austrian-held summit. 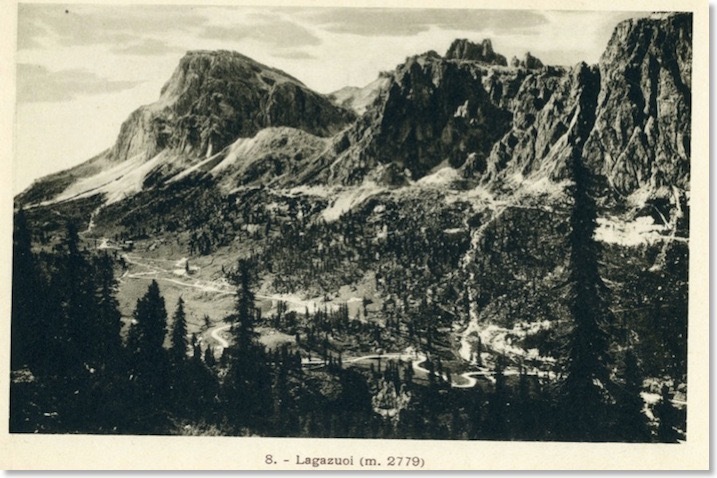 Another huge mine destroyed Austrian fortification just to the left of where “(2668)” has been written. 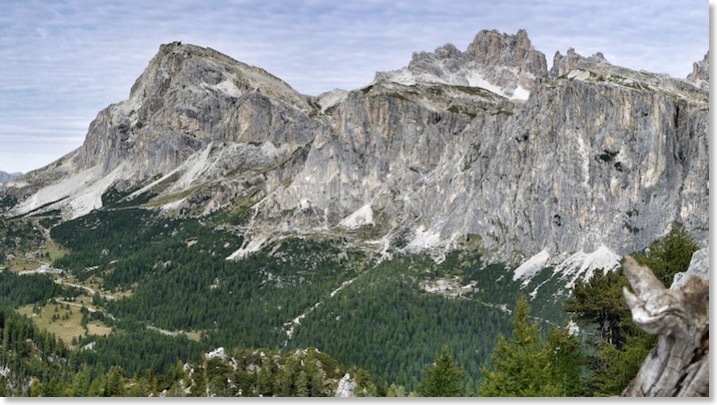 This coincides with the area of lighter rock and scree just above the centre of my own photograph. 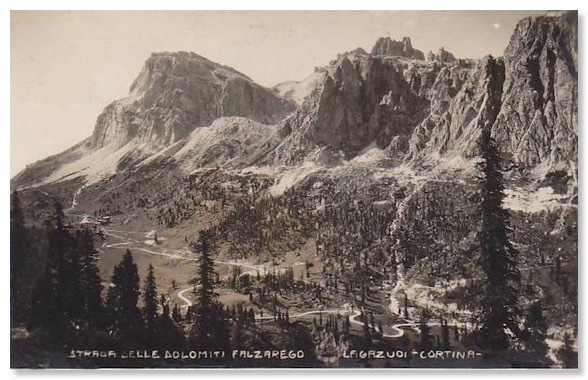 Zardini’s photograph above also shows the post-WW1 shape to the summit of the Piccolo Lagazuoi, which helps to date it. 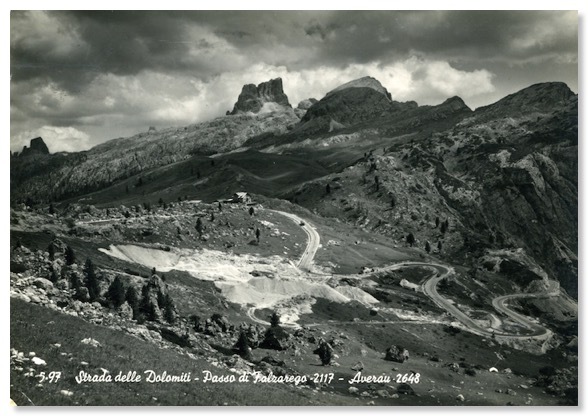 The card clearly shows the more or less horizontal “road” engineered above the tree-line to link together numerous small Italian WW1 fortifications and barrack buildings which were used as a major springboard for assaults on the Austrian fortifications on and around the mountain summits. The ruins of the Italian buildings make for a very interesting day’s exploration.